Canon Zoom Lens Thermos – Now Available For Pre-order! (In Canada) | OhGizmo! 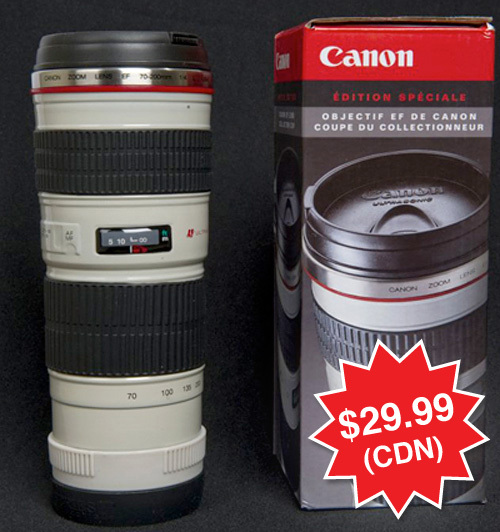 Remember the Canon zoom lens thermos we brought you last week that was exclusively given out to members of the press at the Olympic Press Center in Vancouver? Well it turns out in the very near future they’re not going to be so exclusive. You can actually pre-order one now from Canadian photography store Vistek for $29.99 (Canadian dollars of course) and they’re expected to be available around mid-April. Quantities will be limited though, so if you saw my post last week and were kicking yourself for missing out on getting one at the Olympics, you’ll want to act fast. I feel bad for anyone who over bid on one on ebay. Isn't heat bad for the lens?